This November I participated in Nanowrimo for the first time ever. For those of you that don’t know or have never heard of Nanowrimo it stands for National Novel Writing Month. And every November people strive to reach the objective of writing 50 000 words by the end of the month. It’s a daunting task to say the least. Unfortunately I failed, and I failed hard. I thought I’d share my project, my experience being a newbie, what I learned, and what I can improve and work on to succeed at Nanowrimo next year. I started fresh on an idea that had been in my head for a while. I went into Nano with barely a one page summary of what my story would be about. A simple premise for the story and the characters. Having signed up at the last minute, there was little planning done on my part. I was no where close to the amount of planning and outlining that some participants do in October to prepare to write in November. I simply had a short summary and a few key scenes jotted down in bullet point form. My project was originally a dark fantasy. I intended for it to explore some themes of life and death, as well as time. I went in with the intention of creating a serious story but the characters had a mind of their own and insisted on making it more a comedy, with a few dark twists thrown in. Overall it will never see the light of day until it goes through extensive revision and rewriting. 1.I didn’t have a real plan, or outline. I was pantsing this year, basically just start writing an see what happened. That was an awful idea. Things were going well for my story until I was about 15, 000 words in, then I had no idea where my story was going. One reason was I was getting lost in my own plots and subplots, which is horribly embarrassing. They would go astray and I would completely forget where I wanted them to go in the first place. The second reason was that since I had no real outline I also didn’t have any clear cut scenes created. I had a few to work with in the beginning, but as I wrote I just continued adding scenes I though worked, or were interesting. That did not make for a cohesive story and I ended up losing inspiration and motivation to continue as the story went on. The fix: A very clear fix for this one = write an outline for the plots and as many key scenes as possible before jumping in an writing the story. Despite having the best intentions to write like a mad person everyday I did not end up doing that. I started off quite strong but when week three rolled around that’s where I really lost momentum. I didn’t write for about almost a week straight which is probably what pushed me into the danger zone, and then I just couldn’t write enough to make up for those lost days. This one is entirely on me. I have a habit of getting bored with things and distracted by new ideas, and different projects that spring to mind – always while I’m supposed to be focusing on something else. Ideas are funny like that. The fix: Don’t take any days off!! Even if I start feeling lazy and distracted. 3.I didn’t know my story. I knew the main idea of the story, but not it’s true direction. 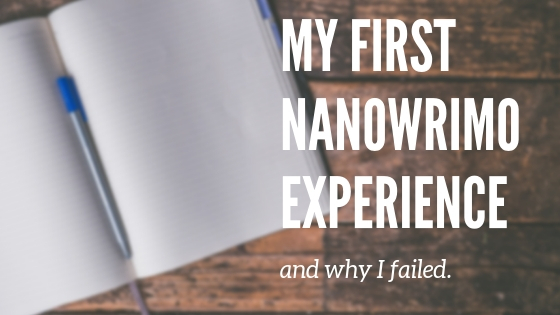 I didn’t know where it would end up when I started writing. I literally had no ending, so I was writing with no end in sight. That is motivation killing for real. I knew the characters themselves, but I couldn’t accurately nail down where they were going or where they would end. How the characters interacted with each other was another main issue. This one actually got a bit better over time though, essentially I got to figure out their relationships a lot better while writing the scenes. The fix: I will definitely be planning earlier next year, and taking the time to really mull over what the story will say, and where it will go. I will definitely be fleshing out the significant sections of the story before I start writing a single word, or picking names for every character and their ancestors- which is a wonderful and terrible habit, a lot of fun but takes you away from the actual plotting and writing. I might have to force myself to write the ending first so I know where I need the story to end up. Thanks for reading! And let me know about your own Nanowrimo experience.